With the popularity of online gambling reaching a new high, online casinos have to compete with each other to lure in customers. Known for its exceptional visual effects and broad selection of games, Goliath Casino is worth checking out. 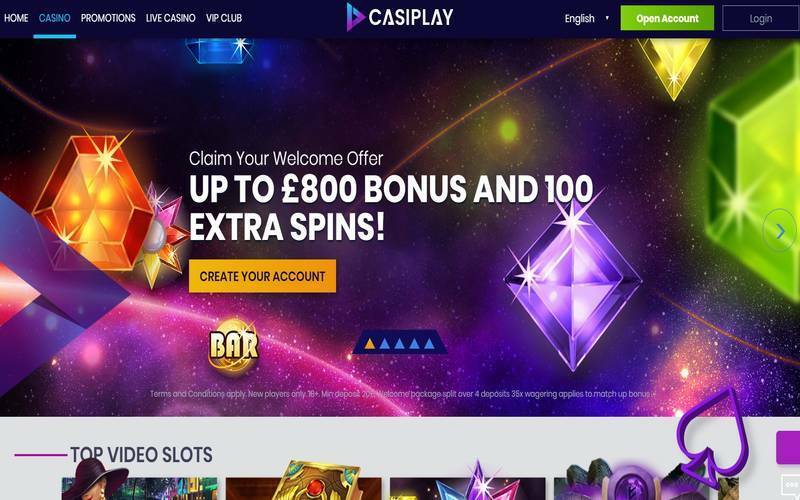 This casino is one of the newer additions to the world of online gambling, but nonetheless it still holds its own with competitors by offering solid bonuses and promotions. Goliath Casino has a bunch of unique features that can’t be found in most online casinos, such as scratch cards, and sports betting. Most players, who play casino games for real money, are interested in the different features offered at the casino. Due to the high popularity of online gambling, casinos are competitive when it comes to offering unique features in their attempt to draw in new players and keep their customer base. Goliath Casino gives players exactly what they want which is fast payouts and high jackpots. Goliath Casino is one of the only online casinos that hosts Sportsbook betting. Goliath offers a variety of virtual slot machines from well-known software developers, like Microgaming, NetEnt, Play’n Go, NeoGames, Evolution Gaming, Bally, and many more. What casino would be complete without a variety of table games? Goliath features all the standard table games found in land-based casinos, like Blackjack, Poker, and Roulette. Goliath doesn’t stop there, and has 10 live dealer games. This innovative approach to bring authenticity to game play is a new trend in online casinos. A real person deals the cards over a live stream. Goliath Casino knows what sports fans want and really cater to their needs by allowing players to bet on just about any type of sport imaginable. Goliath offers players a chance to bet on almost any sport of interest, including handball and other less popular sports. The Sportsbook at Goliath Casino is one of the more expansive ones found in the online gambling industry. Any sports betting enthusiasts will be able to customize bets to their preference. 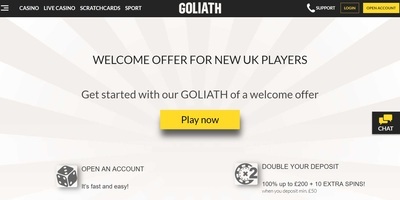 Goliath Casino offers new players a warm welcome in the form of a generous bonus. This promotion is exclusive newly registered players and available on their first 5 deposits. Upon registering, new players receive 100% match up on their initial deposit of up to €200. Players also receive 10 bonus spins on the Starburst slot machine. A bonus of 50% match up on the second, third, and fourth deposits of up to €200. Finally on their fifth deposit, new players receive a bonus of 25% match up to €400. Returning players can join the VIP program and receive monthly point bonuses that can be converted into cash rewards. Goliath Casino takes all the necessary steps to provide safe and secure transactions. Players can rest assured that all their banking information is protected by the newest SSL encryption. Goliath Casino offers a variety of ways to deposit funds and start playing. There are convenient ways to deposit money using, not only Visa, but also Entropay, Instadebit,, Paysafecard, Bank Wire Transfer, Eps, Zimpler, Euteller, ecoPayz, Neteller, Skrill, Trustly, and Sofort. All deposits are available for immediate play. Detailed instructions are available on their website. Withdrawals are processed within 72 hours after cash out with no minimum requirement. Full Terms & Conditions apply! Visit official website for full information!